NEW YORK (AP) — Gov. 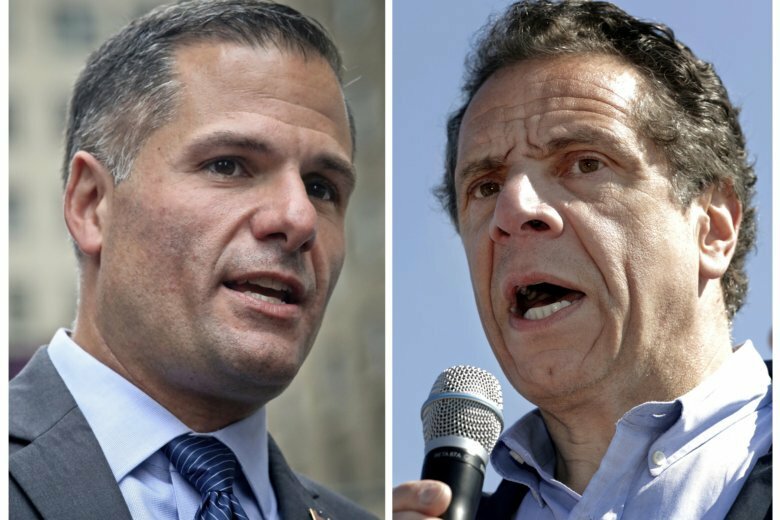 Andrew Cuomo called his Republican challenger an acolyte of President Donald Trump, and Marc Molinaro punched back by assailing the Democrat as corrupt as the two candidates faced off Tuesday at their only scheduled debate before next month’s election. The exchanges were sharp and unfriendly, with constant interruptions and talking over one another. Cuomo, at one point, called Molinaro Trump’s “Mini-Me,” a reference to the evil sidekick in the Austin Powers movies. Cuomo is far ahead in the polls and in fundraising, and until this weekend, showed little interest in debating his lesser-known Republican challenger. “The extreme conservative wing that Mr. Molinaro and Mr. Trump represent exclude everything. They’re anti-women. They’re anti-LGBTQ,” Cuomo said after a question about education policy. He brought up votes Molinaro had taken in the state Assembly, including one against a bill barring the use of handcuffs on pregnant inmates in labor. Molinaro said at the time that he did so because he thought doctors and corrections officers should have some discretion, for safety reasons. At one point, Cuomo asked Molinaro repeatedly if he supported Trump. Molinaro refused to answer, instead saying that he supported policies that would strengthen the country’s economy and that New York’s economy was lagging behind. Molinaro, who has said he did not support Trump in 2016, criticized Cuomo’s handling of the upstate economy and property taxes and accused him of abandoning responsibility for the Metropolitan Transportation Authority, the agency that oversees New York City’s beleaguered transit system. While most of the debate was heated, the last few moments turned somewhat lighthearted in a “lightning” round, where the candidates were asked about winning the lottery and what they would do with the money, as well as songs they thought represented their campaign. They both declined to sing. The debate didn’t feature the three third-party candidates: Libertarian Larry Sharpe, Green Party nominee Howie Hawkins or former Syracuse Mayor Stephanie Miner, an independent.